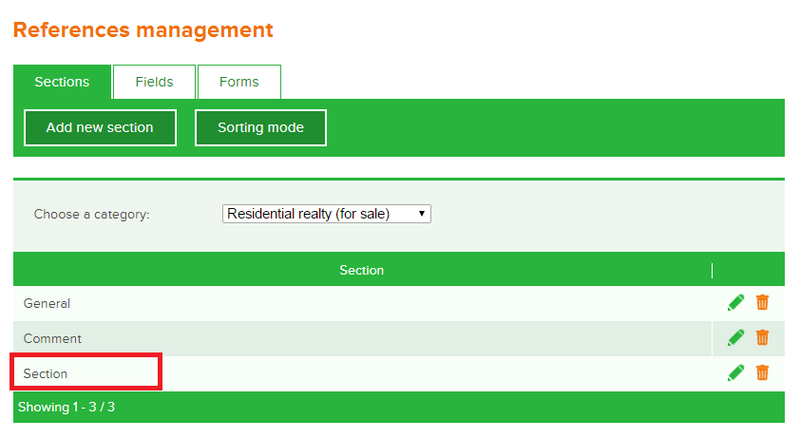 Administration panel>System>Field editor provides you with an opportunity to manage search forms, fields, blocks of information in listings and users profiles. 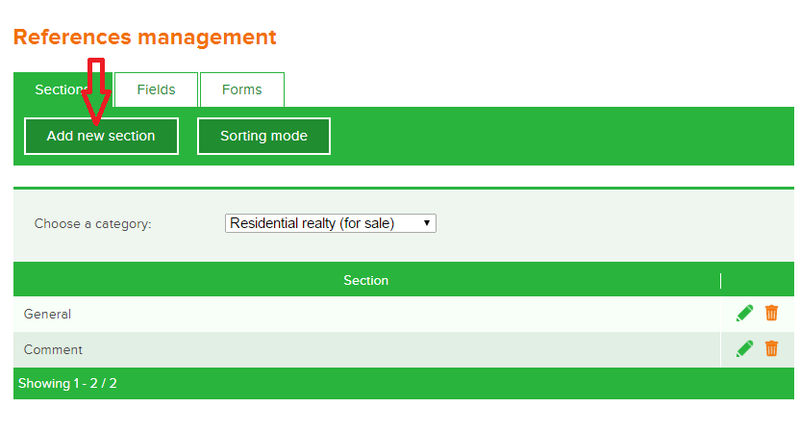 There are three main sections available in References management: Sections, Fields and Forms. Sections stands for adding and editing information blocks. Open the drop-down list. 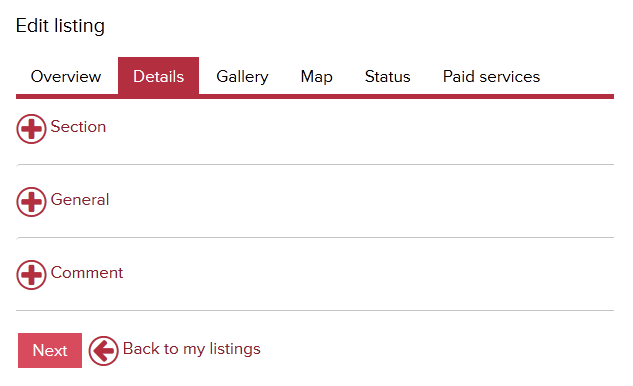 As you see you can edit listing properties for every category (residential, commercial, lots/land) and type of operation (for sale, for lease, etc.) separately. It means that a listing may contain different set of sections and fields depending on a category and/or type of operation. Select the category to which you want to add a new section. Press «Add new section» button to create a new one. Fill in the required information and save it. Keyword is a unique name of the section which is displayed in the database only. Use a unique keyword for every section. Name is a name of the section which is shown on the site. The new block is available only for the category to which you add it. 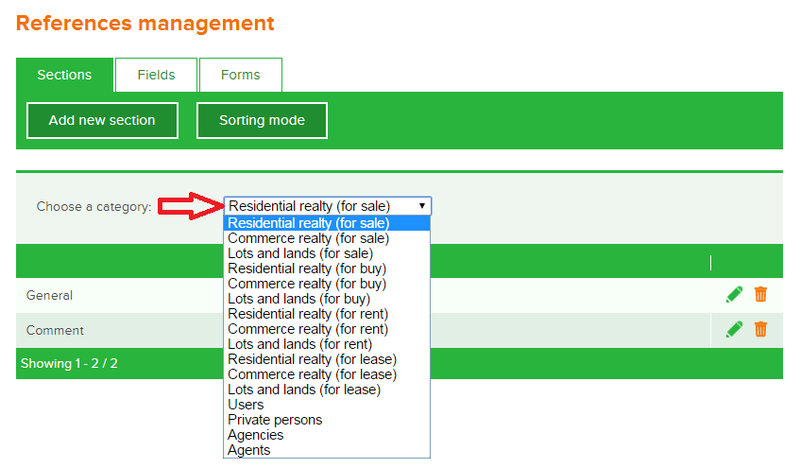 The sections for categories “Users”, “Private persons”, “Agents”, “Agencies” are invisible in user mode. 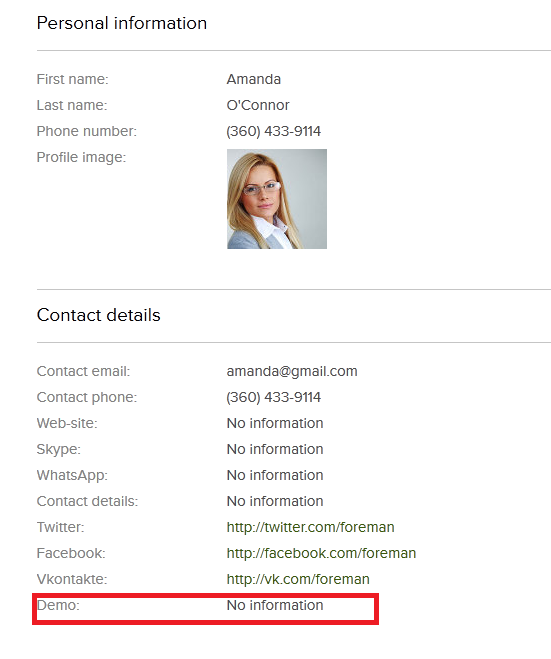 Only the fields of these categories will be shown in users profiles in Contact details. 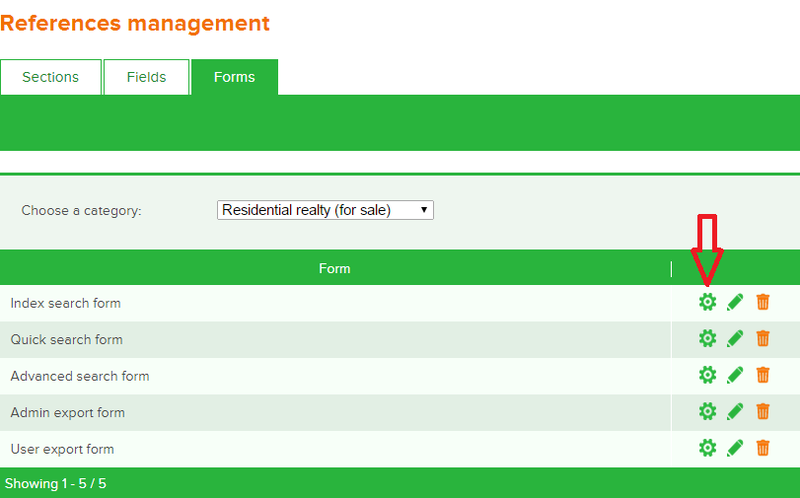 “Users” category contains fields, which are the same for all types of profiles: private persons, agents and agencies. 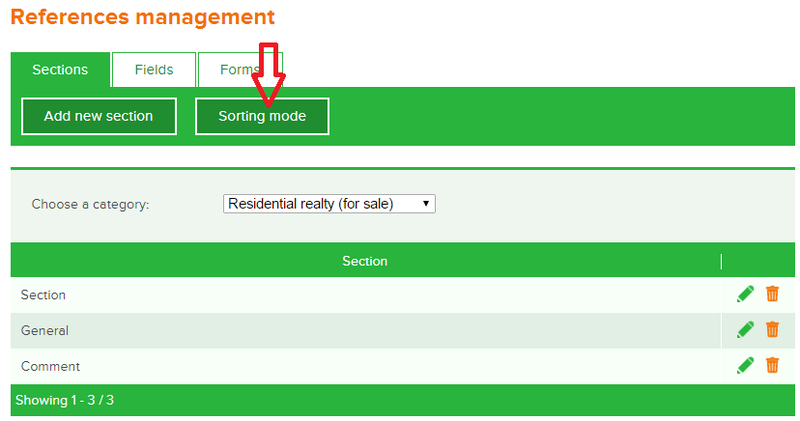 To change a sequence of the sections press “Sorting mode” button. Drag-and-drop the items and save the sequence to change the order of the sections. 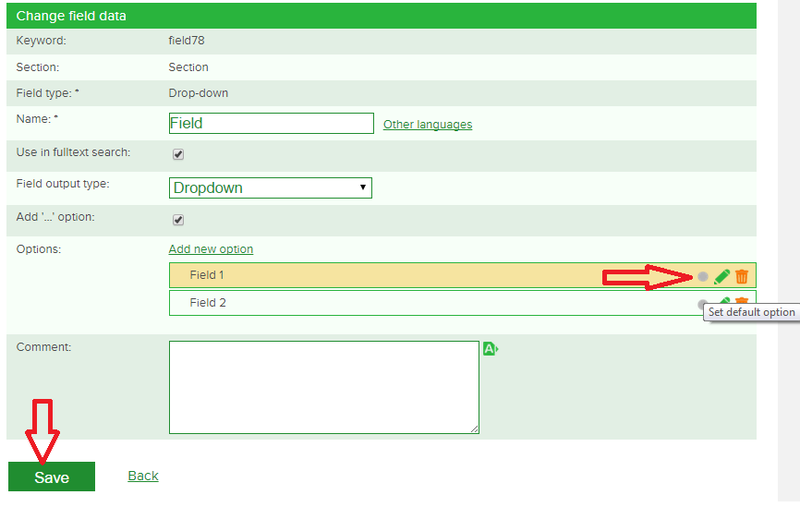 Fields allows you to add new fields to the sections. 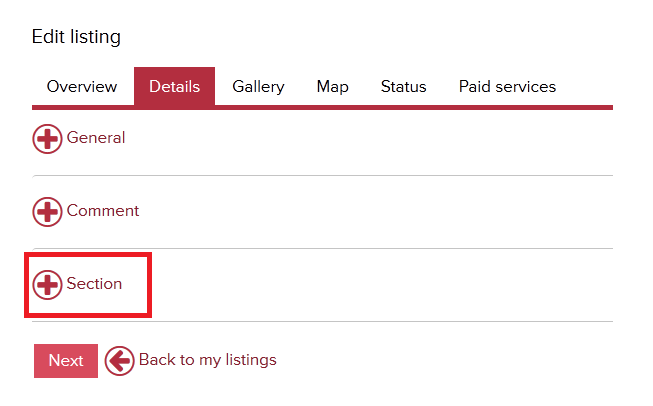 Choose the category and the section to which you want to add a field. Click “Add new field” to create a new one. Write a field name, select field type and press “Save” button. 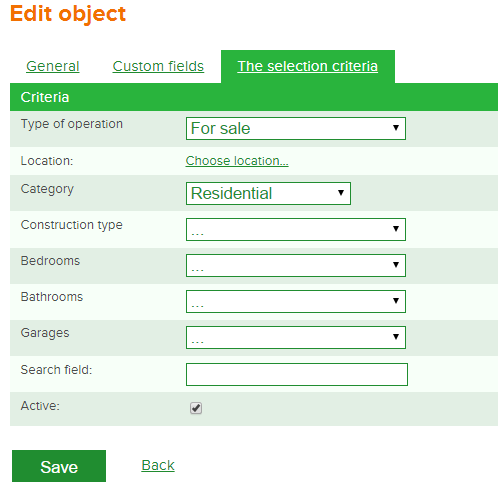 If you choose drop-down or multi-select as a field type, it is necessary to add options after saving a field. Click circle icon to set a default option and save the changes. By adding a new field to “Users”, “Private persons”, “Agents” or “Agencies” categories, the fields are shown in My profile>Edit profile>Contact details. The name of the appropriate section is displayed only in the administration panel. 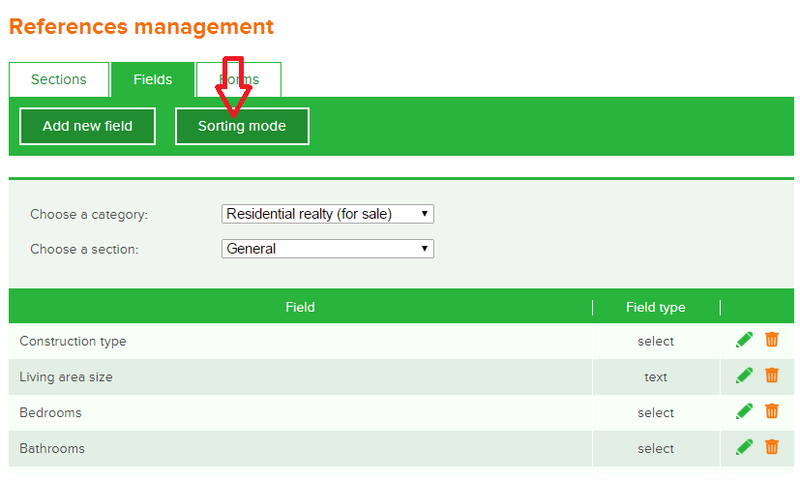 Sorting mode is for changing order of fields in the sections. 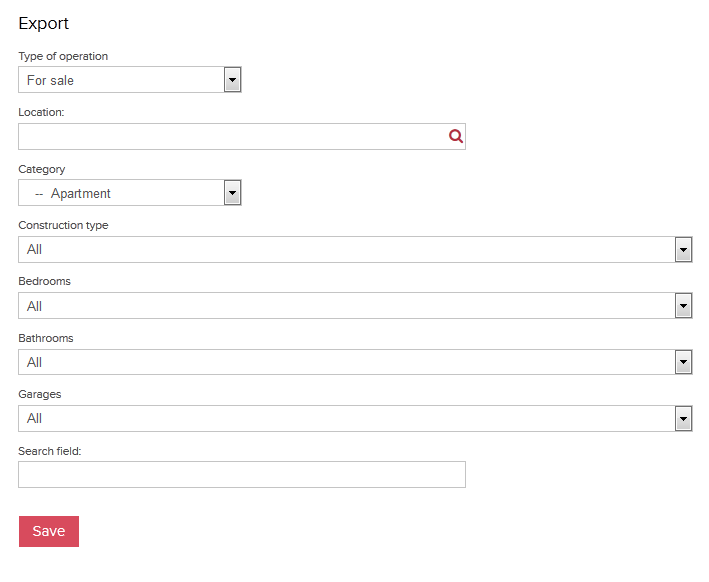 Forms tab is used for adding fields to different types of search and export selection criteria. You will see five available forms here. 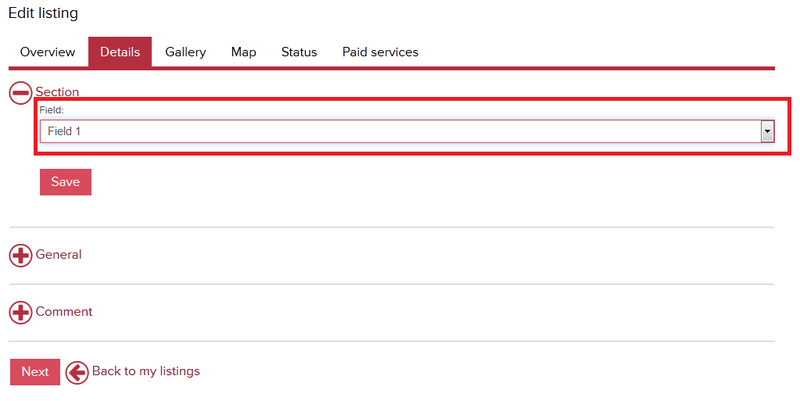 Index search form is a search form on the main site page. Quick search refines search parameters. Advanced search form gives more refinements. Admin export form stands for the selection criteria by export in the administration panel. User export form stands for the selection criteria by export in user mode. 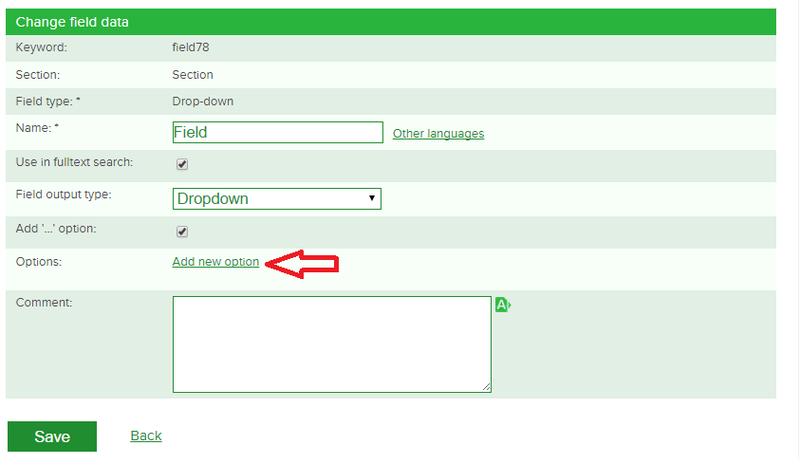 To add a new field to the form, choose the category from dropdown list and the form. Click settings icon to get to Form fields editor. 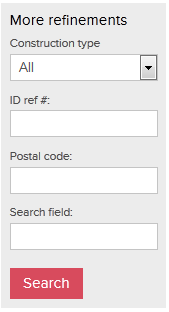 Press “Add field into form” button, choose the necessary section and then the field. It is possible to add a section into form. To do that, click “Add section into form”, write a name and save. Click plus icon to add fields to the newly created section.